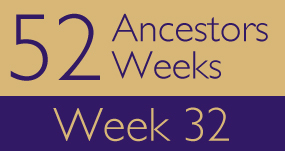 Genealogist Amy Johnson Crow, who blogs at No Story Too Small, has set a challenge to write about one ancestor each week. I’ve decided to take up that challenge to wake up my (somewhat) languishing blog, and to honor my ancestors. I plan to post every week on Sunday, and I encourage others to join the challenge with me. My great-grandmother Emma Tyler (1868-1910) from Abertillery, Wales had a brother named Bazil. He was about 3 years older than his sister Emma, and was born in Cwmtylery/Cwmtillery, Monmouthshire, Wales. It’s been fun (yeah, right) chasing down the different ways his first name and surname appear in the records. Great-uncle Bazil was first listed in the Wales census in 1871, when he was 6 years old. He and his family were living in Cwmtillery West; his father was a former labourer, but now an invalid, and his mother was a dressmaker. Also in the household were his two step-siblings, Samson and Mary Jane Hathin, from his mother’s previous marriage. In 1881, he’s working as an apprentice in the tin plate works, and is living with his now married sister Mary Jane Pollard. His father seems to have passed away, as Bazil and Mary Jane’s widowed mother is with them as well, and they are in Abertillery, a little more than a mile from where they were in 1871. As a 25-year-old, in 1891 Bazil is living on Castle Street in Abertillery. He’s now head of the household with his mother, a niece, and a boarder, and is a tin plate washman. After 1891, the trail goes cold for my great-uncle Bazil. When you can’t find someone, you need to start thinking that he has either died or emigrated. In Bazil’s case, I think he emigrated. The U.K. Outward Passenger Lists, 1890-1960 shows a “Bail” Tyler, born 1865, departing Liverpool for New York on 4 July 1891, a few months after the census. The corresponding arrival on the New York, Passenger Lists, 1820-1957 shows “Basel” Tyler arriving in New York in mid-July. His occupation on the outgoing passenger list is labourer, and on the incoming list—fireman! I’m not sure why this would change for the same person. Did he take a job on board ship? The census records in the United States for an English(/Welsh)-born man named Basil Tyler don’t show any matches until 1920 in Madison County, Illinois. If this is my great-uncle (or even if he’s not), I don’t know where this man was between 1891, when he arrived in America, and 1920! Either he has been indexed in some terrible manner, he missed being enumerated, or he left the U.S. and went somewhere else until 1920. This Basil Tyler who appeared in the 1920 Illinois census passed away in 1926. His parents were listed as both being born in England, and he was single when he died at the age of 60. I haven’t sent for the death certificate, but I wonder if the informant would even know the names of this man’s parents. Is this my Basil/Bazil Tyler? It’s a shame that he didn’t marry or have children. It’s not often that I have an English or Welsh ancestor who left the U.K. for America, where I live. I always hope to find a distant cousin on my shore. It remains to be seen if this Basil Tyler is my ancestor, but it’s nice to dream about. I will have to follow up to see.